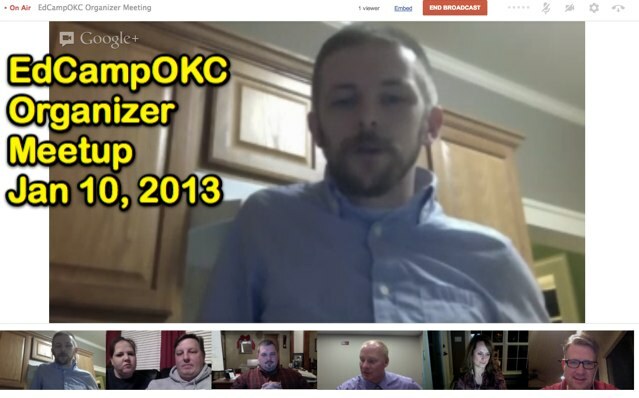 We held a virtual organizer meeting for EdCampOKC tonight on January 10th, via a Google Hangout. Our attendees included Adam Zodrow @zodzilla, Ami Steelman @ChargerTIS, Joshua Williams @JSW_EdTech, Luke Steelman @ChargerTech, Shawn Blankenship @Blankenship_S, Tammy Parks @tparks, and Wesley Fryer @wfryer. Our entire meeting was recorded and is available on YouTube, but we’ve edited/removed the first seven minutes of “getting set” as everyone got logged in and connected. (YouTube’s option to edit and “trim” posted videos is wonderful!) The recording is 56 minutes long. In addition to confirming everyone’s desire to move forward with our February 23rd date (now just 43 days away) we discussed committee assignments for sponsors, PR, website/social media, t-shirts, food, and more. We are going to continue meeting on Thursday nights from 7-8 pm CST each week leading up to our February 23rd conference. Please join us if you’d like to help. Join our Google+ Community and RSVP for our next Google Air / Hangout Event linked there. Free registration for EdCampOKC is now online and available! Use the registration button below or visit edcampokc.eventbrite.ca. We are also actively soliciting sponsors for EdCampOKC 2013. Josh Williams has agreed to head up this committee. See our sponsorship page for more details and contact info for Josh. Please make plans to join us for EdCampOKC on Saturday, February 23, 2013 in Yukon, Oklahoma! Let all the educators in and near Oklahoma know as well so they can plan to attend. The price is right for this great day of high quality, teacher-led professional development: FREE!